After the recent, devastating effects of Hurricanes Irma and Maria, storm preparation and resiliency are once again topics on many New Yorkers’ minds. Here in Battery Park City, five years after Superstorm Sandy made landfall, BPCA continues its work on a comprehensive approach to resiliency, working with our government and community partners to help better protect people, property, and infrastructure from the effects of climate change. What follows is a summary of the work BPCA has in progress — and what we’ve already completed. 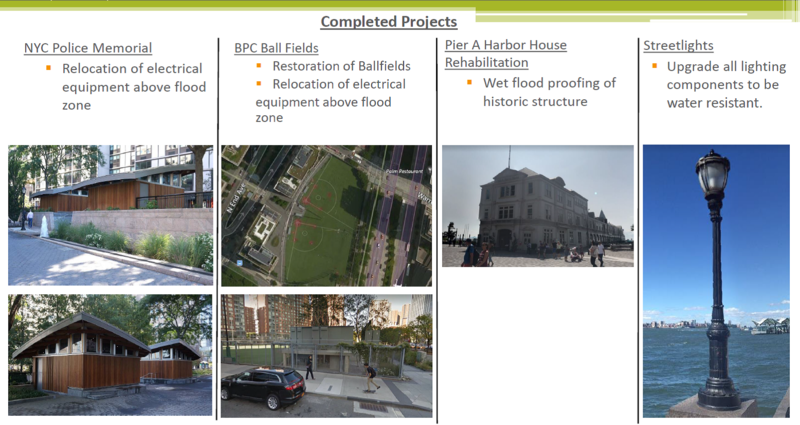 BPCA undertook an overall resiliency study in 2015, which helped inform the following initiatives to harden and protect Battery Park City’s 92 acres from storm surge, flooding, and sea level rise. These efforts include projects at both the northern and southern ends of BPC – at Chambers Street and Wagner Park/Pier A Plaza, respectively, where portions of the neighborhood were inundated during Superstorm Sandy from water along West Street — and will continue to be closely integrated and coordinated with the City’s Lower Manhattan Coastal Resiliency (LMCR) planning processes through regular and active consultation and interface. 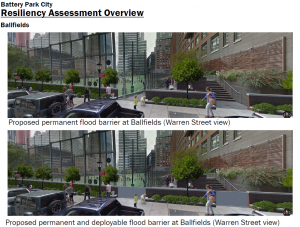 North BPC Resiliency Project — This effort will cover Battery Park City’s North Esplanade and entail a deployable barrier crossing West Street / Route 9A. As with the BPC Ball Fields, an RFP is currently being developed, also with an estimated completion by year’s end. BPCA then plans to conduct engineering design in 2018 and commence construction a later date to be determined. 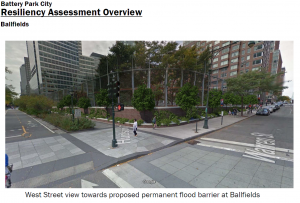 Additional Phases – Additional phases, to include Battery Park City’s western perimeter by employing garden / park walls to create a new line of flood protection are in the preliminary planing stages with a schedule to be determined. 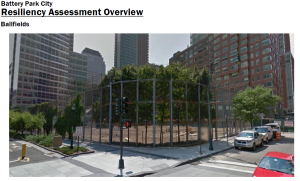 South Battery Park City Resiliency Project (based upon completed 2017 Wagner Park Assessment), Including Wagner Park & Pier A Plaza (and potential Battery Place extension to State Street): BPCA conducted a conceptual design process in 2016-2017, including multiple rounds of public feedback, resulting in the issuance of a Design RFP last July, with responses due in October. The concepts developed as part of RFP development can be found by clicking here. In response to the RFP, multiple proposals were received and are now being evaluated. Detailed design work for south BPC resiliency is scheduled to commence early next year, with physical site work to tentatively begin toward the middle/end of 2019. NYC Police Memorial Electrical Vaults — BPCA has recently completed relocation of the Police Memorial’s electrical equipment housing above the flood zone (for more information, click here). BPC Ball Fields — BPCA has replaced the BPC Ball Fields surface with heavier, more resilient turf material less prone to lifting when flooded, and relocated the fields’ electrical equipment above the flood zone. Pier A Harbor House Rehabilitation — Wet flood proofing of historic structure has been completed. BPC Streetlights — BPCA has upgraded all its lighting components to be water-resistant. There is much still to be done to plan and prepare for a threat we know is increasing. BPCA looks forward to continuing this necessary work together with a wide range of state, local, and community neighborhood stakeholders for a better, stronger, more resilient lower Manhattan for all.